The Mad Ghoul, frankly, is an above-average monster movie, starring some of the recognizable actors from the genre in the 1940’s. In short, Dr. Alfred Morris (George Zucco) is a college professor and researcher, who has uncovered and recreated a poisonous gas first used by ancient Mayans, used to create “death in life” – robbing the victims of their own will, similar to the classic zombie movies of the 1930’s and 1940’s. He hires a medical student named Ted Allison (David Bruce), since he needs his surgical skills for the grisly “cure” to the poison — a fresh heart is a crucial ingredient. The original experiment on a monkey seems successful — at first. Ted is in love with the lovely Isabel Lewis (Evelyn Ankers) who is embarking on a professional singing career, and feels like she’s moving emotionally away from Ted. Unfortunately, the much older Dr. Morris also has designs on Isabel, and in a treacherous moment he exposes Ted to the gas. It’s only later that he discovers that the cure is only temporary, requiring periodic applications of the cure — with a need for fresh hearts. Poor Ted is unaware of his actions while under the doctor’s control, only recalling them vaguely as dreams. As Isabel goes on a nationwide singing tour, Ted and Dr. Morris following, with Ted’s frequent relapses requiring trips to the cemetery, digging up the recently dead and using Ted’s surgical skills to harvest the corpses’ hearts. Until a caretaker wanders upon them, and an unwitting Ted commits murder — for the first time. As the story progresses, an intrepid reporter begins to follow the Ghoul’s trail across the country, finally realizing the the Ghoul is following the itinerary of the singing Isabel, and tries to capture him in a trap — which leads to his death, since he doesn’t realize that he’s on the trail of two men, one of whom murders him while he’s busy with Dr. Morris. Compounding the romantic triangle is that fact that Isabel has begun to fall in love with her pianist, Eric Iverson (Turhan Bey, the “Turkish delight) — making Eric the next target of the mad doctor. 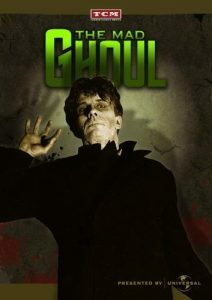 The Mad Ghoul is a very enjoyable movie, which my children and I enjoyed very much, and we hope that you do as well. By the way, a “ghoul” in mythology is a living corpse that feeds on the living – a fairly accurate description of the titular monster. Dr. Alfred Morris (George Zucco, The Monster and the Girl). The amoral scientist who, initially, only wants to test the validity of his discovery. But then uses it to try and steal Isabel’s affection. Isabel Lewis (Evelyn Ankers, Son of Dracula). Ted’s fiancee, and a professional singer who’s embarking on her professional career. And feeling less attached to Ted as the story progresses. Eric Iverson (Turhan Bey, Ali Baba and the Forty Thieves). The pianist who accompanies Isabel on her musical tour … and becomes something more to her. When Dr. Morris experiments with a poisonous gas first used by the ancient Mayans in their sacrificial rites, he discovers that it produces a “death in life” state in the subject. It also has severe, irreversible side effects of advanced decomposition that can only be temporarily halted by a potent mixture of herbs and fresh human hearts. Guess who can’t wait to test it on his unsuspecting lab assistant Ted? Grave-robbing, corpse desecration, murder and total madness follow. Despite the grisly title, The Mad Ghoul (1943) is a visually stylish thriller with a quintessential mad doctor performance by George Zucco and memorable roles for David Bruce as the title character and forties “Scream Queen” Evelyn Ankers. Dr. Alfred Morris: [Lecturing to his class] We have lethal gases which are usedfor a definite purpose… to kill. The poison gas of the natives had a definite purpose, but it not bring death though, but death in life, or, if you prefer, life in death. Ted Allison: Would I? Say, there isn’t a fellow in class who wouldn’t give a leg to work with you in the lab! Dr. Alfred Morris: [Tongue in cheek] Oh, that’s rather more than the privilege is worth. You needn’t give me a leg; just lend me a hand. Ted Allison: I can’t help feeling a sense of evil in all this. Dr. Alfred Morris: Moral concepts? I’m a scientist. To me, there is no good or evil, only true or false. Work with one; discard the other. Det. Garrity: [Regarding Eric] Nothing ghoulish-looking about that guy to me. Sgt. Macklin: You can’t tell about these musicians. A lot of them are pretty queer ducks. Det. Garrity: Anyone in this town who gets into a cemetery tonight won’t get out alive. Sgt. Macklin: [to Isabel] Suppose he’s two people, the man you love and the ghoul? Egan (mortician): For goodness sake, whatever you do, don’t mar the coffin! ‘Scoop’ McClure: What kind of corpse do I make, Mr. Egan? ‘Scoop’ McClure: Never mind. That’s one disadvantage I want to keep for a while. Dr. Alfred Morris: [Responding to the corpse sitting up and pulling a gun on him] Reports of your death seem to be greatly exaggerated. Dr. Alfred Morris: [Shocked to find Ted destroying the formula] You fool! You madman! What have you done? Ted Allison: I’m sending this evil back into the darkness! Dr. Alfred Morris: Ted, you’re mad! You can’t do this! Ted Allison: You’re wrong, Doctor. There’s nothing left of it now but you, and me, and this!